Kieran Keane makes two changes from last week’s draw with Worcester for tomorrow’s game in Galway. Healy has scored eight tries this season. 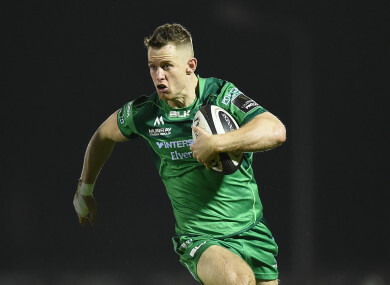 MATT HEALY WILL reach the landmark of 100 Connacht appearances when the western province look to secure a home quarter-final in the Challenge Cup against Oyonnax tomorrow afternoon [KO 2.30pm]. The winger — who is now the province’s top try scorer in Europe — is in a rich vein of form having crossed eight times this season and is included in a strong side named by Kieran Keane for Connacht’s final Pool 5 outing. Ultan Dillane, Kieran Marmion, Quinn Roux and Bundee Aki all start having been included in Joe Schmidt’s Six Nations squad during the week, with Keane making just two changes from the 24-24 draw with Worcester last week. Healy’s return to the wing is the only change in a settled back line while Naulia Dawai comes in to join Eoghan Masterson and captain John Muldoon in the back row. Having secured a quarter-final spot with the draw at Sixways, a win over bottom club Oyonnax will ensure home advantage in the knock-out stages for Connacht. “We know Oyonnax are a physical outfit, they have serious players, and whatever side they send over, whether frontline or second, they are still registered players, and we have to deal with everything they throw at us,” backs coach Nigel Carolan said. Email “Healy to make 100th Connacht appearance as Keane's men go in search of home quarter”. Feedback on “Healy to make 100th Connacht appearance as Keane's men go in search of home quarter”.